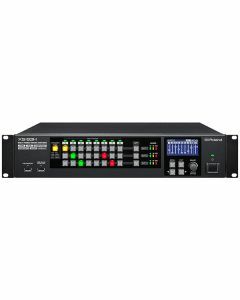 The Roland XS Series - the new line of Multi-Format Matrix Switchers designed for fixed installations requiring high-quality integrated video and audio conversion and switching. Version 3.0 introduces powerful new features for live events and enhanced audio matrixing. A single unit solution for total control of video and audio that is flexible enough to meet the diverse needs of classrooms, conference rooms, live presentations and events. The XS-83H is the 8-in x 3-out version feauring HDBaseT outputs.